On a HP dc7900 i have Ubuntu 16.04 on /dev/sda2 and 18.04 on /dev/sda1, both booted via grub. I never had any problems with 16.04, so I guess the hardware is OK. I don't know the exact message anymore. Boot-Repair intelligently removed 18.04 from grub. How can I add 18.04 back to grub? No problem filesystem on sda1 is read/write accessible, no errors at all! So the filesystem seems to be still OK? Are all these superblocks defect or is there some other problem? To me it seems the information about the filesystem type may have been damaged. 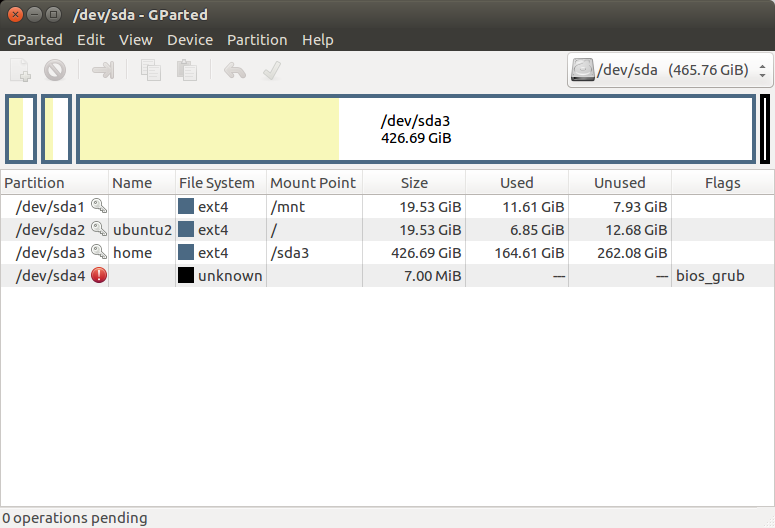 How can I set it to ext4? Can the 18.04 instance be rescued or reinstalled? sometimes it hung when powered down. when clicking "settings" it would definitely freeze. What wondered me, at reboot I never saw a fsck. Are superblocks updated at powerdown? can these freezes be the cause of defect superblocks? No Windows on this system. sdb and sdc are zfs mirror disks, not relevant. I tried boot-repair: it issues an error. To me it seems the filesystem type is missing on sda1. /dev/sda2: UUID="28bb4996-360d-4639-9e50-86aae98011fe" TYPE="ext4" PARTLABEL="ubuntu2" PARTUUID="2e36442b-f19f-4226-8912-aa2f7238d7c1"
/dev/sda3: UUID="9b34e80a-e998-424e-98b9-8decdfe851d6" TYPE="ext4" PARTLABEL="home" PARTUUID="62ee15b5-cbc6-4a84-98a9-cdfe9989549f"
/dev/sdc1: LABEL="zfs-samba" UUID="4660143235353326727" UUID_SUB="4506863601154525374" TYPE="zfs_member" PARTLABEL="zfs-42c380b70bbdd342" PARTUUID="000598e0-1e8f-0240-af28-8d231f696a01"
/dev/sdb1: LABEL="zfs-samba" UUID="4660143235353326727" UUID_SUB="15368172379392166768" TYPE="zfs_member" PARTLABEL="zfs-00675688e5b3099d" PARTUUID="79a673f3-670f-7744-8a4c-27a45ad7597b"
/dev/sdd1: UUID="2018-07-25-03-21-56-00" LABEL="Ubuntu 18.04.1 LTS amd64" TYPE="iso9660" PTUUID="663eb4c4" PTTYPE="dos" PARTUUID="663eb4c4-01"
/dev/sdd2: SEC_TYPE="msdos" UUID="0D5F-1DB6" TYPE="vfat" PARTUUID="663eb4c4-02"
Without -t ext4 it fails. You MUST have good backups before proceeding! If you have any problems at this point, then STOP, ping @heynnema with info. Not the answer you're looking for? Browse other questions tagged boot grub2 18.04 boot-repair or ask your own question.